The Tracy Fire Department originally received a call at around 11:30 a.m. of a burning structure at Bird Road and Interstate 580. When crews arrived, they found two fires, one along the interstate and a second, larger fire sweeping south across the hillsides fanned by midday winds. Crews from Tracy fire and Cal Fire — including bulldozers, helicopters and airborne tankers — began to tackle the flames burning the hills. An hour earlier, a transformer failed at Chrisman Road at I-580. 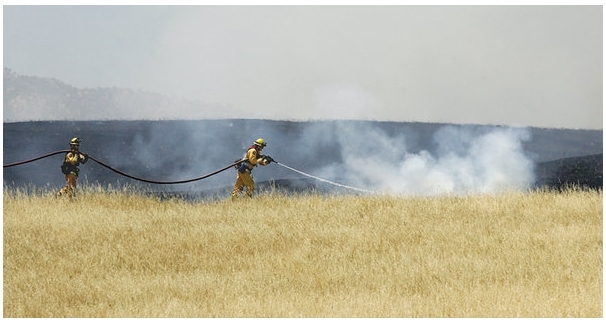 A power line was also found down at the Bird Road fire scene, part on the roadway and part in the field. Fire officials think the power line may have been a contributing cause to the fire, but are still investigating. Tankers dropped flame retardant as crews on the ground worked to stem the forward progress of the flames. Helicopters maneuvered near power lines to drop water on spots where the fire jumped the line. By 1 p.m., crews had the fire 90 percent contained, and the fire was fully under control by 2:30 p.m. Fire crews were expected to stay on scene through the day, mopping up hot spots and watching for flare-ups.